layer of crème fraîche, with a little bit of dill and capers worked into it. Next goes a layer of smoked salmon slices, and then a sunburst pattern of thin steamed asparagus spears. Slice a red onion very thin and cut the slices to produce little onion crescents. Sprinkle these over the salmon and asparagus. Finally, fry four eggs sunny side up and slide them onto the plate. This should serve two people easily. A second recipe also starts with a soft tortilla. But this will end up as a Breakfast Taco. Fry the tortillas briefly in olive oil, remove them from the skillet and gently fold them into the taco shape. In your skillet fry up some bacon, two slices per taco, and set aside to drain. Next, in that same skillet with its bacon fat, quickly wilt some baby spinach, and then set it aside. Now you toss in some sliced onion, which you fry until it becomes transparent. Push to one side while you fry some eggs, this time one per taco. Built the taco with bacon on the bottom, then your spinach, your onion, a thin slice of tomato and finally the fried egg. It will be gloriously messy to eat, but every bite will be pure pleasure. Sticking with the sandwich theme, let's talk about making a Cibatta Poached Egg Sandwich with spinach, pancetta, and aioli mayo. Start by cutting a cibatta bread into sandwich size pieces. Slice each piece in half, and toast in the oven for just a few minutes. Poach one egg for each sandwich, then fry up the pancetta with the spinach. About 30 seconds should get the job done. Blend crushed garlic into a bit of olive oil mayonnaise (a new, very welcome product) and spread it over both sides of the toasted cibatta. Stack the spinach, pancetta on top, and then finish it with your poached egg. Again, it's going to be a mess to eat, but worth every drip and drop. 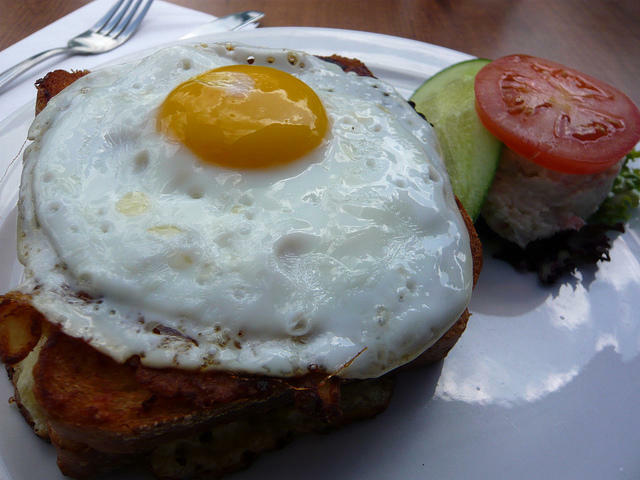 Finally, let's do a little variation on that French classic, the Croque Madame. This time we will start with a thick slice of French toast, hot out of the skillet. Lay down a thin slice of ham, sprinkle a little grated gruyere cheese on top of that. Next come a dollop of béchamel sauce spread evenly over everything, with a bit more of the grated cheese. Put it all on a cookie sheet and pop it under the broiler for no more than 30 seconds. The béchamel sauce will start to brown and bubble. Take it out, let it cool for a minute and then top it off with a poached egg, salt and pepper. This one you want to eat with a knife and fork.